It’s POTLUCK day! On the interwebs. I’m talking about the #SoLetsPigOut Potluck, a virtual get-together hosted by two beautiful and talented women, Em & Gina, who decided it’d be fun to gather their interwebs friends and collect a heap of recipes for one fantastic midsummer celebration. Have you ever been to a virtual potluck? It’s the same as a regular potluck, except you can show up pants-less and no one will be the wiser. My contribution to the party is pie! Because pie makes friends wherever it goes. And I like friends. And pie. As a recent transplant to the Pacific Northwest, marionberries are new to me – have you heard of them? Or tried one? They’re a variation of blackberry, indigenous to the state of Oregon, and they’re so, so good. Plump and juicy and sweet, with some tartness thrown in for good measure. I’ve seen them popping up in goodies all over the place here (muffins, scones, smoothies, jams, smooth jamz, etc.) which makes sense because they’re in season just now. But I wanted in on the fun and, after a glimpse at the latest cover of Bon Appetit, I knew a pie was in order. I used frozen marionberries because I found a reasonably-priced enormo bag of them at Whole Foods, and most of you won’t be able to get your hands on fresh ones, anyway, so let’s embrace the frozen berry! They make for one fantastic pie. Happy (virtual) potlucking, friends! Make sure you check out all of the other pot-lucky posts and recipes, here and here. It’s a (virtual) feast day. SO LET’S PIG OUT! If you can’t find fresh or frozen marionberries, traditional blackberries (either fresh or frozen) make a good substitute. First, make the pie crust: pulse the flour, salt, and sugar in a food processor until well-combined (you can also do this by hand, in a large bowl with a whisk). Add the butter and pulse (or work in with your fingertips) until the mixture resembles coarse meal, with both small and large pieces of butter throughout. Drizzle 1/4 cup water over the mixture, then pulse until the dough just begins to hold together. If the dough seems too dry, add more water by the tablespoon until the dough is cohesive but not too sticky. Use floured hands to divide the dough in half, shaping the halves into 1-inch flat disks, and wrap each disk in plastic wrap. Chill the dough in the refrigerator until firm, at least 1 hour and up to 1 day (dough can also be frozen for up to 3 months – thaw in fridge before using). 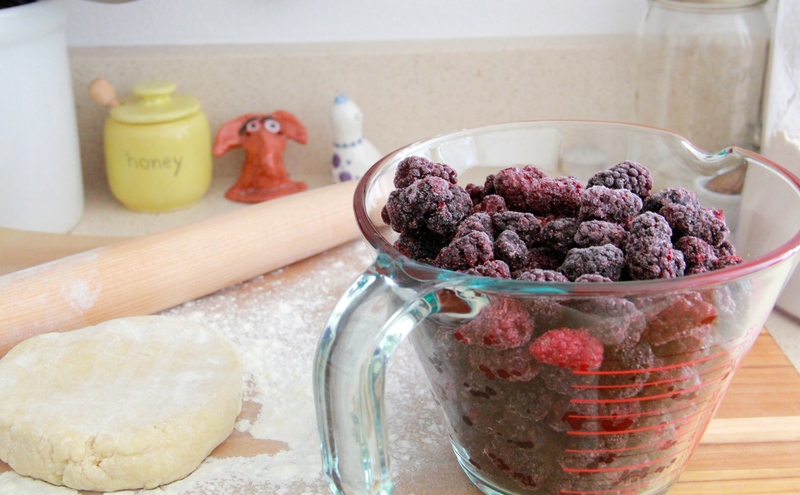 When the dough is almost finished chilling, mix together the filling: In a large bowl, stir together the frozen berries, sugar, cornstarch, and lemon zest until well combined. Set aside. At this point, pre-heat your oven to 375 degrees F, with a rack in the lower third. Remove the dough from the refrigerator. On a well-floured surface (and using a well-floured rolling pin), roll one disk of dough out into a large circle, about 12-inches in diameter and 1/2-inch thick. Carefully transfer this bottom crust to a 9-inch pie dish, gently pressing the dough into the corners of the dish and letting any overhang slump over the sides. Put the dish with the bottom crust in the refrigerator while you roll out the top crust. Roll out the top crust in the same manner as the bottom, until you’ve got a 12-inch round piece of dough that’s about 1/2-inch thick. 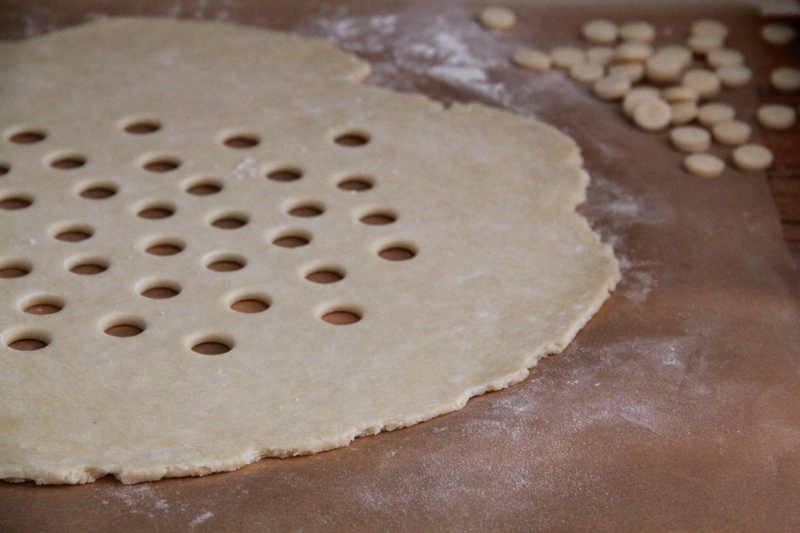 Use a small round cutter (the small end of a large, round piping tip works well here) to cut out holes in the center of the dough, to form the decorative top (leave about 2-inches of border around the edges, so that transferring the crust and crimping it isn’t too difficult). Place the pie dish, filled with the bottom crust, on a work surface, and pour the marionberry filling inside, spreading it to the edges of the pan and mounding any excess in the center. Carefully drape your decorative top crust over the berry filling. Pinch the bottom and top crusts together, then fold them under and tuck them into the sides of the pie dish. Use your fingers or the tines of a fork to crimp the edges decoratively, if you like. Brush the crust lightly with the egg wash, and sprinkle coarse sugar generously atop the pie. 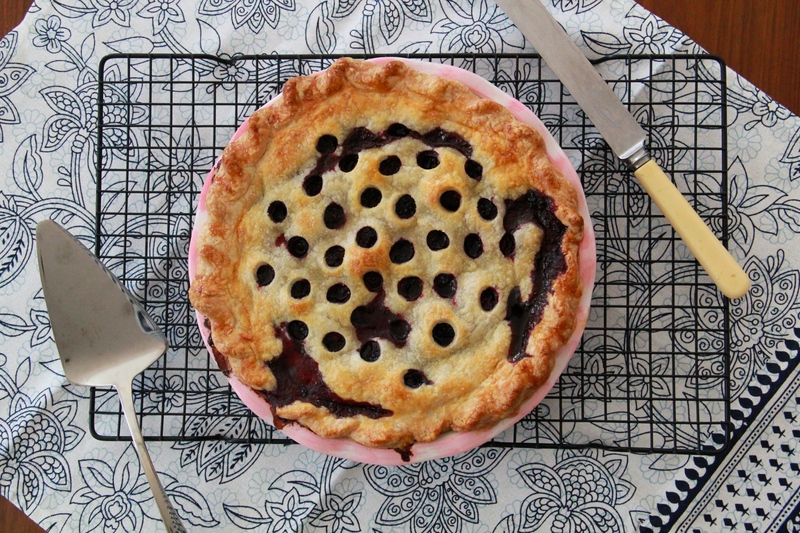 Place the pie dish on a sheet pan (to catch any drippy pie juices), and bake the pie for 60-80 minutes, until the crust is deeply golden brown and the marionberry filling is thick and bubbly. Allow the pie to cool and set for about an hour before enjoying warm or at room temperature, preferably with a big scoop of vanilla ice cream alongside. I’m so jealous that you get all those marionberries! I’ve only had them in jam and can only dream about how delightful they are in a pie! Come to Seattle, girl! marionberries 4 eva. This looks SO good!!! Nice to “meet” you through the potluck. Thanks, Meg! Nice to meet you, too! Good lord this is just sooo perfectly beautiful. I’ve never had marionberries before but now I think I need to get on that. This just looks amazing. So happy to have found your beautiful blog through this potluck! Yay. 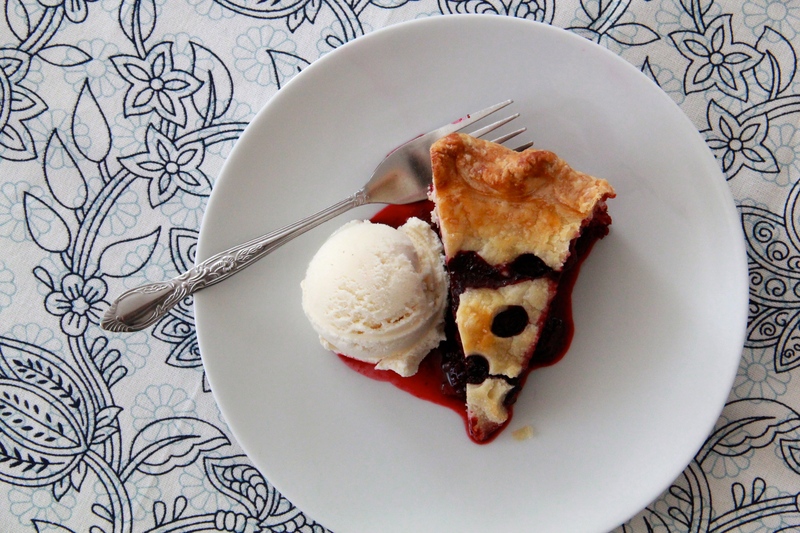 That Bon Appetit cover is so gorgeous, and your marionberry pie is, too! YESSSSSS AIRPLANE EMOJI! Seattle is calling your name!! pants off-dance off with pie? maybe? thanks for organizing, Gina! marrionberries! i’ve never had those but can i assume they’re a lot like blackberries? also… that polka dot crust is damn cute. very much like blackberries! you can easily substitute here. Thanks girl! haha, yes! political pie party! 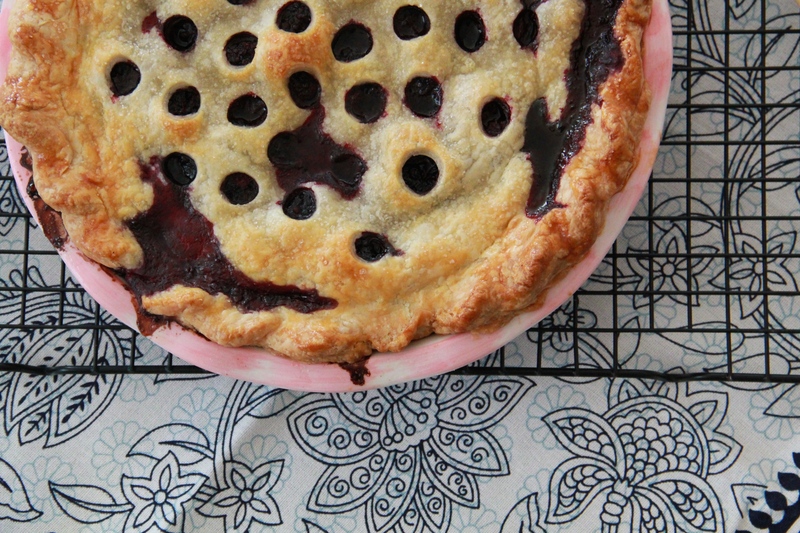 Oh goodness me, I was so smitten with the pie on Bon Appetit – and I’m so stoked to see your translation of that beautiful polkydotty crust right here. It’s gahhhhhhgeous. Thanks so much for joining us for #SoLetsPigOut, Molly! No pants for the win. 🙂 Xo! 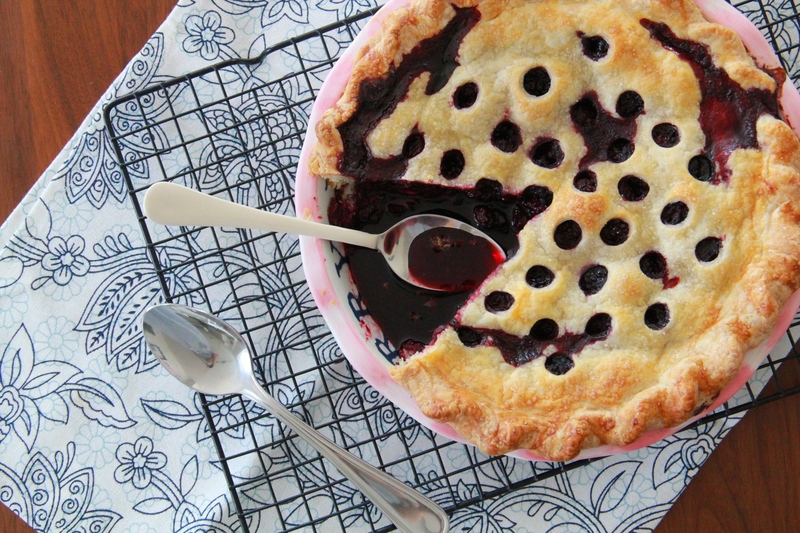 Whoa, this pie is gorgeous! Please tell me you eat those little pie circle cut-outs. I would, one-by-one, without pants on.